Airlines have lounges that shelter their best customers from the travel masses. But you don't have to have super status with a carrier or buy an expensive yearly membership to get inside one of their lounges. For a fee, you can buy a day pass that will give you a more relaxed, quieter airport experience that will get you ready to fly. Below are the rules, cost, and benefits in lounges for five U.S. carriers. American Express has seven Centurion Lounges at Dallas/Fort Worth, George Bush Intercontinental, Las Vegas, LaGuardia, Miami, Seattle, and San Francisco airports. Access is free for Platinum and Centurion cardholders, while others with Amex cards can get in for $50. Once inside, customers have access to a seasonal food and snacks, an open bar with specialty cocktails, shower rooms, work, and relaxation spaces and free high-speed Wi-Fi. The Club has independent lounges at Hartsfield-Jackson, Cincinnati, Dallas/Fort Worth, Las Vegas, Orlando, Phoenix Sky Harbor, Seattle-Tacoma and San Jose airports. For $35, The Club offers free snacks and beverages, including beer, wine and liquor, free Wi-Fi, workstations, printing, faxing, telephones, shower facilities, and a conference room. A new player in the independent lounge game in the U.S. is UK-based Escapes Lounges. Located at Minneapolis-St. Paul International, Oakland International, and Bradley International airports, it costs $30 for children and $40 for adults if you book in advance or $45 for adults and $38 for children if you enter on the day of arrival. Amenities include comfortable seating, a full bar, free high-speed Wi-Fi, free use of iPads, printing and scanning, power outlets and a dedicated business area. There's also free prepared snacks and beverages available from the menu, and you can pay for upgraded meals. While JetBlue does not have its own lounge at its JFK Airport Terminal 5 hub, there is the independent Airspace Lounge, located between Gates 24 and 25. For $25, travelers get amenities including unlimited free soft drinks and light snacks, a full bar, a shower facility, a conference room, free Wi-Fi, power outlets at every seat and help in case of a flight delay. 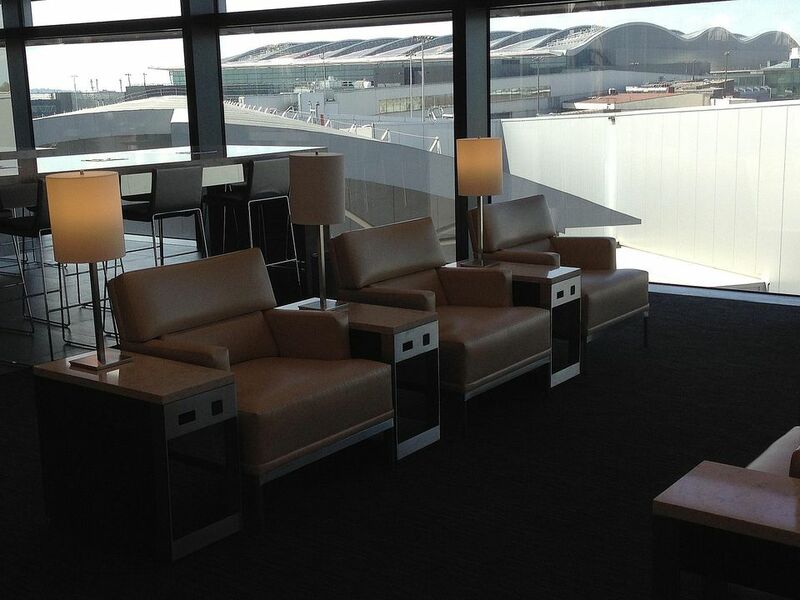 Airspace also has lounges at Cleveland-Hopkins International (Main Terminal just before the B Concourse) and San Diego International (between Terminal 2 East security and the bridge to Terminal 2 West) airports. For $45, Alaska Airlines will sell you a one-day pass to from the check-in desk at its Board Room lounges at Anchorage, Seattle, Portland, and Los Angeles locations. Once inside, customers have access to private workstations, power outlets, private conference rooms, Wi-Fi, faxes, and copiers. it also offers free juices, soda, Starbucks coffee and espresso, beer, wine, cocktails, and snacks throughout the day. American Airlines offers single day access to its 50 Admirals Club locations for $50. Passes can be bought online up to one year in advance, but same-day purchase must be made at a lounge location or self-service check-in kiosk. The club offers free Wi-Fi, house wine, beer and spirits, light snacks, coffee, specialty coffee drinks, tea, and soft drinks, personal use computers with Internet access, cyber-cafes, power outlets, work areas with access to copiers and printers and personal travel help with reservations. Delta Air Lines charges $59 for a one-day pass for access to 33 of its Sky Clubs and partner lounges. Passes can only be purchased at a Sky Club check-in desk. Once inside, guest have access to services including flight assistance, food, non-alcoholic and alcoholic beverages, free Wi-Fi, magazines and newspapers, a business center and television. Some clubs also offer access to shower rooms and conference rooms for business meetings. Those flying Hawaiian Airlines out Honolulu can pay $40 for a one-day pass to its Plumeria Lounge. Passes can be purchased on the Hawaiian Airlines website, a mobile device, at airport kiosks or a lounge agent. The lounge offers customers free wine, local craft beers from Maui Brewing Co., breakfast, lunch and dinner items along with snacks and Wi-Fi. United Airlines charges $50 for a one-day pass to one of its 40 United Club lounges. Passes can be purchased at club locations or through the United smartphone app. Amenities include free beverages, light snacks, and bar service; agent assistance with reservations, seat assignments, and electronic ticketing; free Wi-Fi; conference rooms; periodicals and newspapers; and information on local dining and entertainment options.